Whereas Trump referred only to deportees in his previous remarks, his claim has now expanded to include MS-13 members “in our prisons.” That tweak caught our attention, since it’s a big one. Has the Trump administration taken “thousands and thousands” of MS-13 members off the streets, whether by deporting or imprisoning them? “La Mara Salvatrucha,” or MS-13, is a violent gang formed by Salvadoran immigrants in Los Angeles in the 1980s and now run out of El Salvador. According to the Justice Department, MS-13 has grown to 30,000 members worldwide, 10,000 of them in the United States. By the Justice Department’s count, 7,000 members are clustered in three areas: Long Island, Los Angeles and the Washington region. MS-13 is known for its gory violence — experts say the gang favors edged weapons such as machetes and knives — and both Trump and the Justice Department have been describing their crimes in detail to make the case for tighter immigration restrictions and a new wall along the southern border. They do feature prominently in the White House narrative. Before Trump brought it up in the State of the Union, he claimed that MS-13 had “infiltrated our schools” (April 29); that authorities had removed “50 percent” of MS-13 members in the United States, or 6,000 of them (June 29); and that “we’re throwing them out so fast; they never got thrown out of anything like this” (Aug. 22). Trump signed an executive order in February 2017 that prioritizes law enforcement efforts against “transnational criminal organizations,” a designation that includes MS-13. For this fact-check, we’re going to review figures from U.S. Immigration and Customs Enforcement, the Justice Department and the government of El Salvador. With that in mind, we’re going to dispense with the formalities and say that there’s no way to verify Trump’s latest claims based on the data — because there are no reliable data. Instead, we’re going to evaluate some related information to see whether the president’s claim could be accurate, at least in theory. A White House official pointed us to Operation Community Shield, an initiative from ICE Homeland Security Investigations that began during the George W. Bush administration. Homeland Security Investigations since 2005 has attained “more than 61,000 gang-related arrests; more than 8,100 of those being members or associates of MS-13,” according to an ICE news release from November. There’s no breakdown of those 8,100 arrests that shows how many were of U.S. citizens or how many predated Trump. But in May, ICE was reporting 7,300 MS-13 arrests since 2005, so we could assume an additional 800 members or associates of MS-13 were arrested from May to November. A six-week gang surge in May was the largest to date for Homeland Security Investigations, ending with 1,378 arrests. From that total, 104 individuals were affiliated with MS-13. A separate operation in November led to 214 MS-13 arrests in the United States. ICE deported 2,057 gang members in fiscal year 2016, said Danielle Bennett, a spokeswoman for ICE, and 5,396 in fiscal year 2017, a 162 percent increase. Gang members went from 0.9 percent of total deportees to 2.4 percent year over year. But it’s not evident how many of these deportees were associated with MS-13. A separate set of ICE data shows that Homeland Security Investigations made 432 MS-13 arrests in fiscal year 2016 and 796 arrests in fiscal year 2017, an 84 percent increase. That includes U.S. citizens, Bennett said. These numbers from ICE show a clear surge in law enforcement activity targeting MS-13 since Trump took office, but they don’t show that “thousands and thousands” of the gang’s members have been deported or imprisoned under Trump’s watch. Rather, they continue to show something in the “hundreds and hundreds” ballpark. We also reached out to the Justice Department. Attorney General Jeff Sessions and other officials have echoed Trump’s remarks about MS-13 and have mentioned “thousands” of enforcement cases against this gang. A Justice Department spokesman pointed us to Operation Regional Shield. According to an announcement from Sessions in September, “more than 3,800 MS-13 and 18th Street gang members in the United States and Central America” were charged by the United States or the top prosecutors in El Salvador, Guatemala and Honduras. Most of those defendants were charged outside the United States. Sessions said more than 70 of the MS-13 and 18th Street gang defendants “were living in the United States.” His announcement specifically referenced 18 defendants in the United States affiliated with MS-13. The most recent snapshot from the government of El Salvador shows that in January 2018, roughly 1,090 Salvadorans were deported from the United States, of which 240, or 22 percent, had criminal records. This figure includes both gang and non-gang deportees. A range of data shows Trump’s crackdown on MS-13 has had a discernible impact. But there’s nothing showing that “thousands and thousands” of the gang’s members have been deported or imprisoned since the president took office. At most, there were 1,241 deportees with gang ties who re-entered El Salvador in 2017, according to that country’s government. Meanwhile, according to a patchwork of reports from ICE and the Justice Department, several hundred MS-13 members were arrested or charged in the United States in 2017. It’s important to keep in mind that in many cases, an arrest does not lead to a conviction. There is no database that tallies MS-13 prisoners at the state and local levels, where most crimes are prosecuted. At the federal level, the Justice Department reported 1,200 total convictions for gang members in 2017. The facts do not support Trump’s repeated assertions that “thousands” of MS-13 members have been removed since he took office. 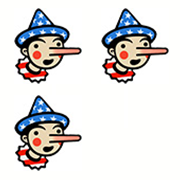 Because the president has insisted with this claim, rejiggering it several times without making it accurate, we are upgrading it from Two to Three Pinocchios. "We have sent thousands and thousands of MS-13 horrible people out of this country or into our prisons." State of the Union address, Washington, D.C.